The stock turbo on the Syclone and Typhoon has a significant mismatch between the exhaust housing and the stock exhaust manifold. To get every last ounce of performance out of the stock turbo, you'll want to port-match the turbo so that it removes any restrictions and unwanted turbulence. This is a relatively simple mod, but it does take a little while to ports nice and smooth. 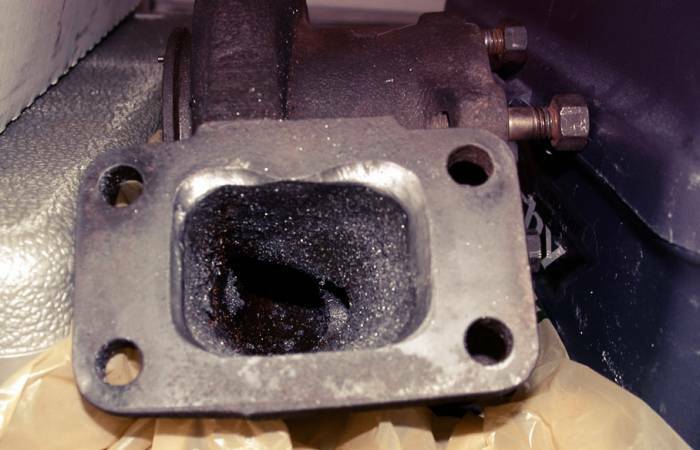 While your doing this, it would be a perfect time to smooth out and bell mouth the turbo intake too. Pull the turbo from the truck. Unbolt the 8mm bolt on the clamp that holds the turbo exhaust housing to the center section. Slide the exhaust housing strait away from the turbo center section. Careful not to nick the turbine blades. This joint can seize up due to corrosion of the metals, you may need to use some PB blaster and some mechanical persuasion to separate them. 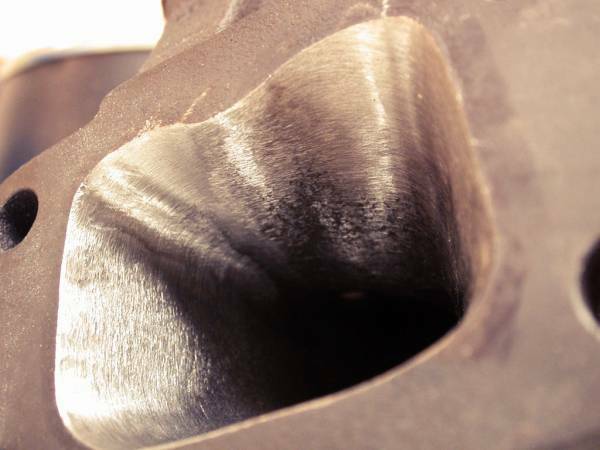 If your'e working with a used turbo, the carbon buildup on the mounting flange will be fairly obvious. 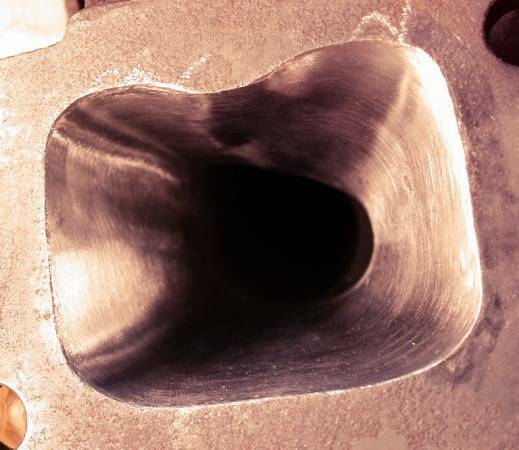 This is the surface you are working to remove so that the exhaust has a smooth transition from the exhaust manifold into the turbine. Here you can see the first cut I made to match exactly where I wanted to remove material. Using a carbide bit, slowly cut the flange down. Remove small amounts of material until you begin to create a smooth transition between the wider opening on the exhaust manifolds. When you first start, it doesn't seem like a lot of material, but after a while you'll see that this is a pretty slow process. The exhaust housing has quite a bit of solid material in it, so you'll be able to cut quite a bit of material out to create a smooth bell. You'll need to use cutting oil or improvise and use something like WD-40. Run through the complete set of sanding drums and flapper wheels. Start at the most course bits, making sure to cut down the surface as smooth as that grade will go. Once the finish is smooth enough to begin with the polishing sponges, switch to them to get the exhaust surface beautifully smooth. 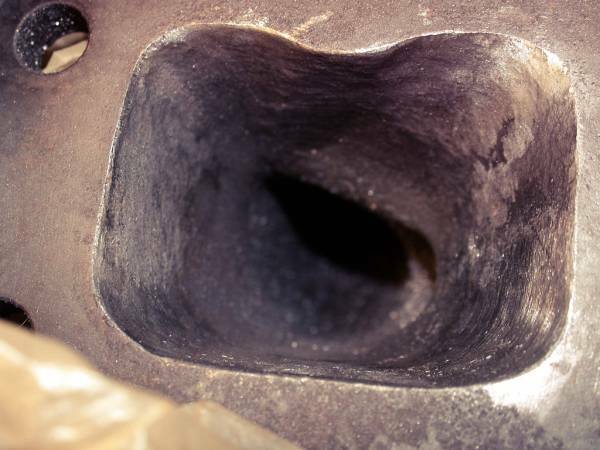 The smoother the surface, the more better the exhaust will flow, and the less likely any buildup will form on the surface over time. The exhaust housing will be full of tiny metal shards, dust and garbage. Make sure you thoroughly clean the inside surfaces of the turbo to prevent any debris from damaging the turbine and catalytic converter. Re-install the exhaust housing onto the center section. 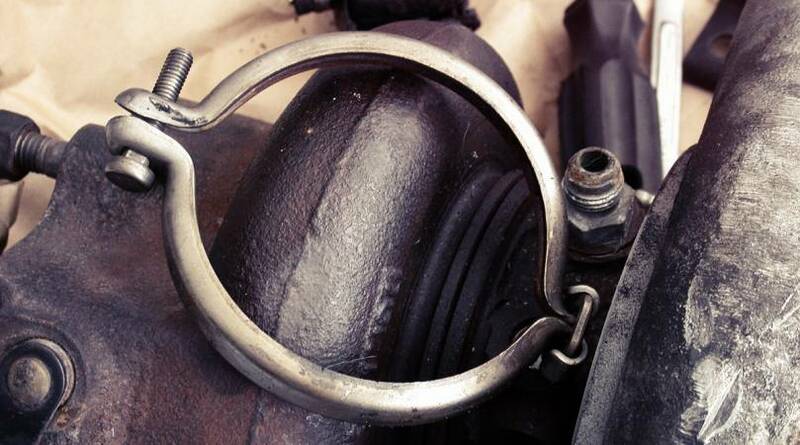 Slide it back over the exhaust turbine and re-install the clamp.